IMCDb.org: 1982 Citroën GSA Spécial in "Transport, 1983"
The GSA was sold as 1980 to 1986 model. 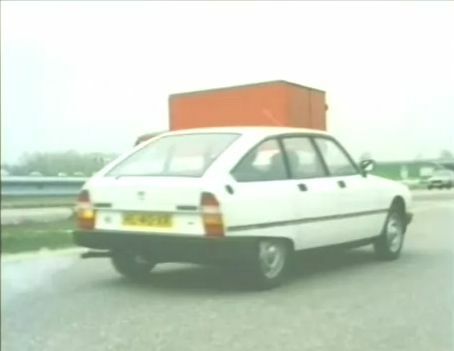 This one is a 1980-84 model, as the episode was released in November 1983. I am lamost sure this is a late 1980+ GSA Spécial version. It has the later rear nameplates, the darker, later bumpers, and the later mirrors on a stalk? I did check brohures year by year - so the badges are 1982+ (changed in similar time what in CXes). In 1982 these wheels indeed are to see only in Special. Also in 1982 bumpers of Special look for a bit darker than they were in 1981, but it can be caused by light/angle of pictures too (but then the same can be with this pic). Nothing about the right rear view mirror.